Last week I got all meated out. Don’t get me wrong, I love eating animals, but I usually only do it once or twice a week. It’s partially a health choice, partially an expense choice, and partially a comfort-zone choice. Once you get used to eating a lot less meat than the average American, it just seems more normal to make rice and beans for dinner than to make a steak. After Passover, Easter and all of the leftovers that followed (brisket sandwiches… brisket tacos… brisket sloppy joes…), I didn’t want to look at any more meat for a while. Instead I made a veggie tortilla soup, omitting the usual chicken in favor of some fresh chickpeas. If you happen to stumble on green chickpeas at a farmer’s market or good produce supplier, they are definitely worth a taste. My favorite way to eat them is sauteed with olive oil, salt and a squirt of lime juice. 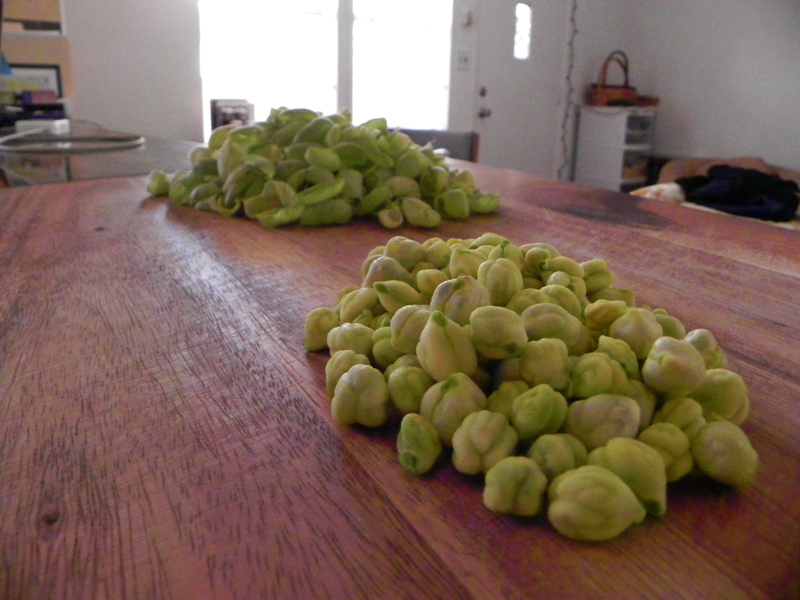 They taste a little like the dried and canned chickpeas, but also a little more like regular green peas. They come in green pods and are a total pain to shell; I’ll just put that out there. This recipe is one of those that can be as canned (literally) or homemade as you’d like it to be. I opted to roast my own chiles and had home-cooked beans, but I also used a can of roasted tomatoes. Whatever works. While everything else in this soup improves over time, the tortillas tend to fall apart. Next time I plan to eat this over a few days, I’ll add a portion of the tortillas each time it’s being served. This begs for all kinds of toppings: avocado, sour cream, you name it. Feel free to use cooked/canned chickpeas, or omit them altogether. It’s a darn good tortilla soup, even without them. 1. 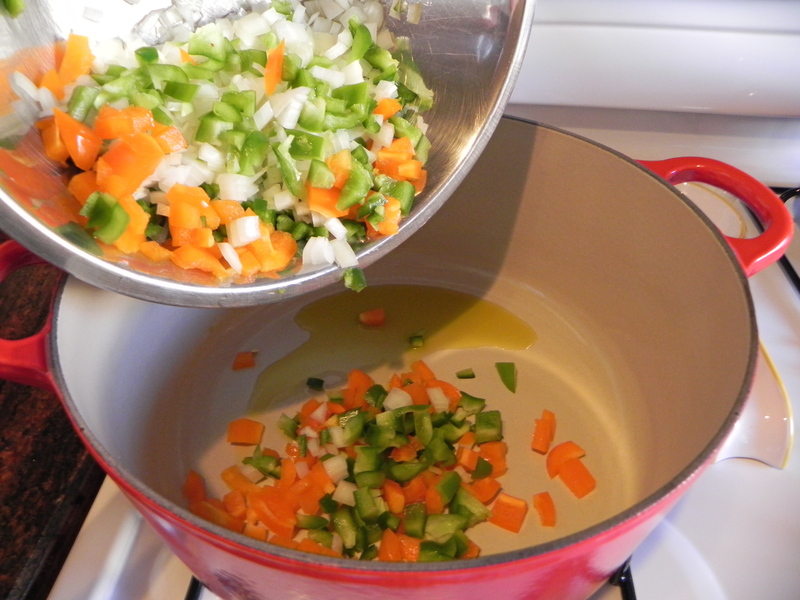 Heat oil in a large, heavy-bottomed pot, and sauté onion and peppers until soft, about 10 minutes. 2. Add salt, ancho chile and cumin. Stir for one minute over medium-high heat. 3. Add hominy and chickpeas, stir for one minute. 4. Add poblanos, garlic, tomatoes, broth, water, and cilantro stems. Once the liquid begins to simmer, turn the heat to medium low and let simmer for 25 minutes, or until the chickpeas are slightly tender. 5. Add beans and tortilla strips and simmer for another 5 minutes. 6. Top each bowl with green onions, cilantro leaves and cheese. *To roast peppers and garlic: place peppers and unpeeled garlic cloves on a baking sheet under the broiler until the skins are charred on all sides. (Garlic takes 5 minutes, peppers 10-15, turning each one over halfway through the cooking time.) Garlic can be peeled and used immediately. Place peppers in a bowl and tightly cover for an additional 10-15 minutes, until the pepper has steamed and is cool enough to touch. Remove charred skin and seeds.